UPDATE: Samsung suffers court ban on Galaxy Tab sales in Australia | What Hi-Fi? An Australian court has temporarily banned Samsung from selling its new Galaxy Tab 10.1 in the country, despite an earlier offer by the Korean manufacturer to modify the device in an attempt to prevent such a ban (see story below). Federal court justice Annabelle Bennett granted a temporary injunction today against sales of Samsung's Galaxy Tab 10.1 in Australia, according to The Guardian. Samsung must now wait until there's a further court order, or until its patent lawsuit with arch-rival Apple is resolved. 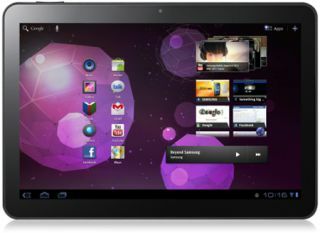 Apple has rejected Samsung's offer to help settle a patent row between the two technology giants over the Galaxy Tab 10.1 (above). Samsung approached Apple last week, offering to help secure a quick court ruling in their Australian dispute, in return for being able to immediately launch the new Galaxy tablet there. But Apple told the Federal Court in Sydney that Samsung's proposal provided no basis for a settlement. "It is one we don't accept and there is no surprise. The main reason we are here is to prevent the launch and maintain the status quo," Apple lawyer Steven Burley said. The BBC reports that the Korean company has agreed to remove some features from its Galaxy Tab 10.1 tablet in an attempt to overturn a sales ban in Australia. Samsung has apparently offered to settle the dispute by removing and changing certain touchscreen features on the device. A court in Sydney will consider the latest move on October 4th. Apple says it needs time to consider the merit of Samsung's proposal. Samsung originally planned to launch the Galaxy Tab in Australia on August 11th, but this was delayed pending the outcome of the court case. Apple and Samsung have similar cases pending in the US, Germany and the Netherlands. Samsung had to stop promoting its Galaxy Tab 7.7, launched at IFA in Berlin last month, shortly afterwards. Back in August, Samsung had to withdraw the Galaxy 10.1 tablet from sale in Europe before being given a temporary reprieve.